These are lyrics by Black Eyed Peas that we think are kind of nonsensical. Black Eyed Peas', "Boom Boom Pow (Clean Version)"
Y'all getting hit with the boom, boom! If you haven't heard the explicit version (or even haven't heard the song at all), I bet you'll never guess what the bleeped word is in the clean version. It is 'satellite'. Now why censor the word 'satellite' when it isn't a swear word? Black Eyed Peas', "Boom Boom Pow"
What do they mean by "I'm so 3008"? Their intelligence level? Their... I can't think of what that number could pertain to. Secondly, what is "two thousand and late" supposed to mean? Black Eyed Peas', "Don't Phunk With My Heart"
Don't phunk with my heart! Apart from the misspelling of funk (which I presume comes from the name of their album, "Elephunk"), how do you funk with someone's heart? Black Eyed Peas', "Hey Mama"
I enjoy this song, but what the heck is a "bambama"? Did they just make up a word to rhyme with mama? Black Eyed Peas', "I Got A Feeling"
This has absolutely nothing to do with the whole song, and I'm pretty sure none of the members are actually Jewish. Black Eyed Peas', "Let's Get It Started"
I love the song, but what exactly do they mean when they say they're gonna 'get hoo-hoo'? Riiiiight indeed, what is Will.I.Am banging on about in this rap? It has nothing to do with anything in the song. And the rhymes are laughably lame, especially the first two lines. I can write better in my sleep. Finally, since we're on the subject of the song, it's even more nonsensical because Fergie is singing about her supposed 'humps'...is it me or is at least a magnifying glass required to see what's she's talking about? She has absolutely no rump to champion. I really don't understand...like WHY should Fergie write about a popular cereal (Cocoa Puffs, of course!)? That's the most nonsensical (if not annoying) song of this decade! 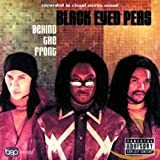 Black Eyed Peas', "Third Eye"
Unless you are either an alien or something has gone wrong with your birth, you only have two eyes.